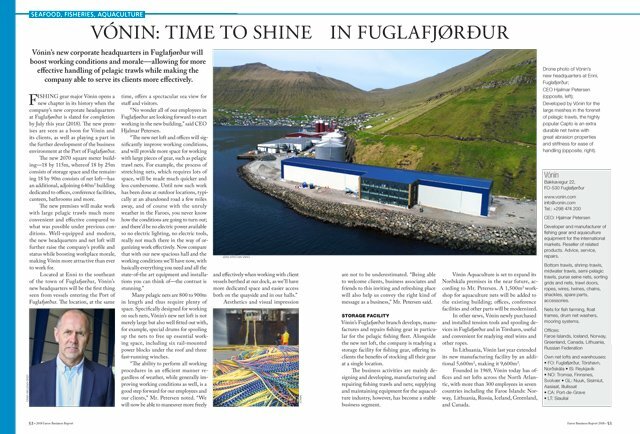 Vónin’s new corporate headquarters in Fuglafjørður will boost working conditions and morale—allowing for more effective handling of pelagic trawls while making the company able to serve its clients more effectively. 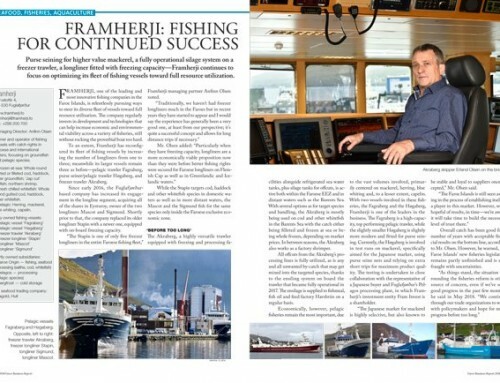 Fishing gear major Vónin opens a new chapter in its history when the company’s new corporate headquarters at Fuglafjørður is slated for completion by July this year (2018). 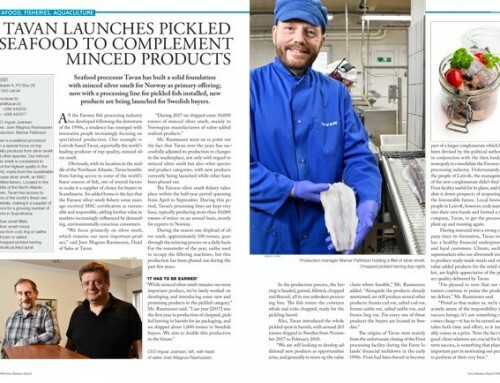 The new premises are seen as a boon for Vónin and its clients, as well as playing a part in the further development of the business environment at the Port of Fuglafjørður. The new 2070 square meter building—18 by 115m, whereof 18 by 25m consists of storage space and the remaining 18 by 90m consists of net loft—has an additional, adjoining 640m2 building dedicated to offices, conference facilities, canteen, bathrooms and more. 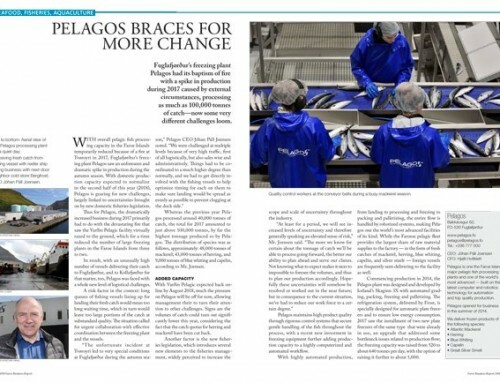 The new premises will make work with large pelagic trawls much more convenient and effective compared to what was possible under previous conditions. Well-equipped and modern, the new headquarters and net loft will further raise the company’s profile and status while boosting workplace morale, making Vónin more attractive than ever to work for. Located at Enni to the southeast of the town of Fuglafjørður, Vónin’s new headquarters will be the first thing seen from vessels entering the Port of Fuglafjørður. The location, at the same time, offers a spectacular sea view for staff and visitors. “No wonder all of our employees in Fuglafjørður are looking forward to start working in the new building,” said CEO Hjalmar Petersen. Many pelagic nets are 800 to 900m in length and thus require plenty of space. Specifically designed for working on such nets, Vónin’s new net loft is not merely large but also well fitted out with, for example, special drums for spooling up the nets to free up essential working space, including six rail-mounted power blocks under the roof and three fast-running winches. Aesthetics and visual impression are not to be underestimated. “Being able to welcome clients, business associates and friends to this inviting and refreshing place will also help us convey the right kind of message as a business,” Mr. Petersen said. 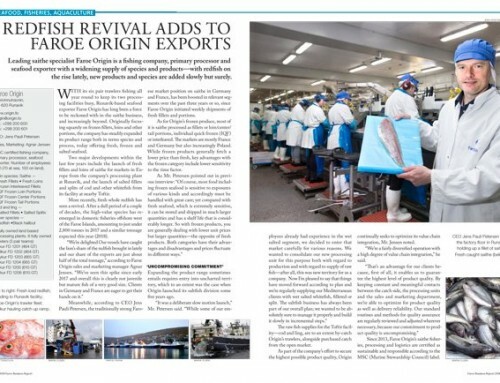 Vónin’s Fuglafjørður branch develops, manufactures and repairs fishing gear in particular for the pelagic fishing fleet. Alongside the new net loft, the company is readying a storage facility for fishing gear, offering its clients the benefits of stocking all their gear at a single location. The business activities are mainly designing and developing, manufacturing and repairing fishing trawls and nets; supplying and maintaining equipment for the aquaculture industry, however, has become a stable business segment. 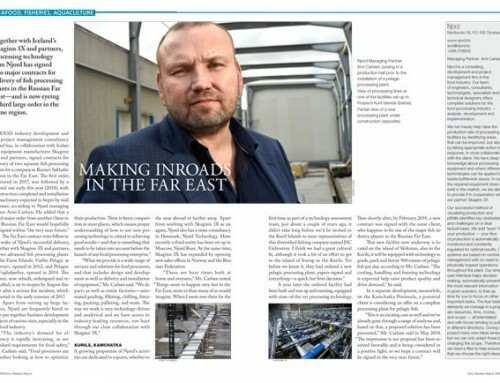 Vónin Aquaculture is set to expand its Norðskála premises in the near future, according to Mr. Petersen. A 1,500m2 workshop for aquaculture nets will be added to the existing building; offices, conference facilities and other parts will be modernized. In other news, Vónin newly purchased and installed tension tools and spooling devices in Fuglafjørður and in Tórshavn, useful and convenient for readying steel wires and other ropes. In Lithuania, Vónin last year extended its new manufacturing facility by an additional 5,600m2, making it 9,600m2. Founded in 1969, Vónin today has offices and net lofts across the North Atlantic, with more than 300 employees in seven countries including the Faroe Islands: Norway, Lithuania, Russia, Iceland, Greenland, and Canada.